WEDNESDAY, APRIL 24 Ada Senior Citizens – 12:30 p.m. in community room at Community Health Professionals, Ada. Memorial Park Bridge Club – 1 p.m. at Pro Shop Annex. Dean Pees, a 1967 Hardin Northern graduate, will return to Ohio for some special activities this spring. Pees, currently the defensive coordinator for the Tennessee Titans, will be a commencement speaker at Bowling Green State University at a 2 p.m. ceremony on May 18. Kenton High School’s annual Senior Awards Day program is set for 9 a.m. Tuesday, May 14 in the high school gymnasium. This program is open to the public. Scholarship awards from the R.E. 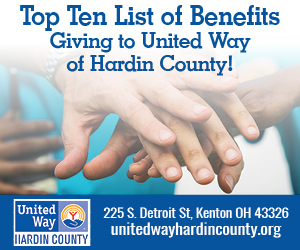 and Joan S. Allen Scholarship Foundation, Dollars for Scholarships, the Kenton Excellence for Education Foundation, memorial scholarships, local scholarships, and other awards will be announced. “The Earth Goes Round and Round” will be the theme of Toddler Time on Thursday at the Ridgemont Public Library. Open to children birth through pre-K, programs will begin at 10 a.m. in Mount Victory and 5 p.m. in Ridgeway. 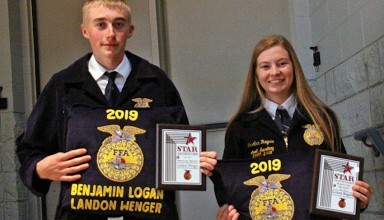 On April 15, Benjamin Logan FFA members, families and friends gathered for the 48th Annual Parent/Member Banquet. The meal was provided by Amy Forrestt of In Good Taste Catering. The Benjamin Logan Stem Club competed Thursday, April 11 through Saturday, April 13 at the National Robotics Challenge held in Marion. 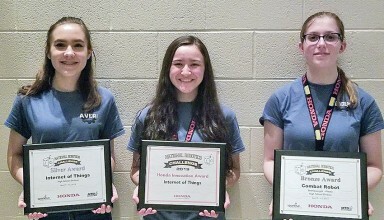 The Internet of Things team placed highly for the third year in a row with (from left) Averi Lane and Annika Simovart bringing home the silver award. The Fortnightly Literary Club met at the home of Kay Doll on Friday, April 12. Fifteen members were present to enjoy refreshments provided by Kay. Penni Smith, president, opened the meeting with a short essay on friendship entitled “Get Yourself Some Girlfriends” in honor of Best Friends’ Day and appropriate to their book this month. Goshen Youth met on April 9 at 7 p.m. at the First Baptist Church and elected officers. The new president is Raya Weaver, the vice president is Devan Dulin, the secretary is Claire Bailey and the reporter is Dillon Dulin. “Medical Bullying” will be the topic at the Hardin County Chapter of the Weston Price Foundation meeting on Thursday, April 25 at 7 p.m. at The Forbing Community Center, 122 North Main St. Kenton. Local mom Traci Kraft will be leading a discussion about medical bullying by telling the story of her family's journey through the medical system with their disabled child and sharing what they learned. 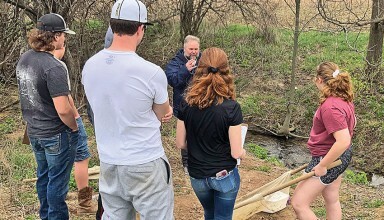 Benjamin Logan Agriculture Education and Environmental Science students recently worked with Dennis Clement from the Ohio EPA to conduct a water analysis of the stream located on the school campus. 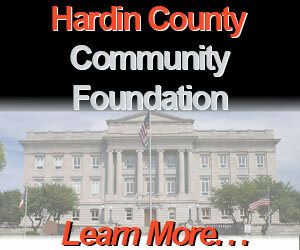 The Hardin County Commissioners on Tuesday morning conducted their first of two public hearings on a plan to make a one-half percent county sales tax permanent. Commission Chair Roger Crowe said the tax initially was adopted in October of 2004 and went into effect in January of 2005 for five years.